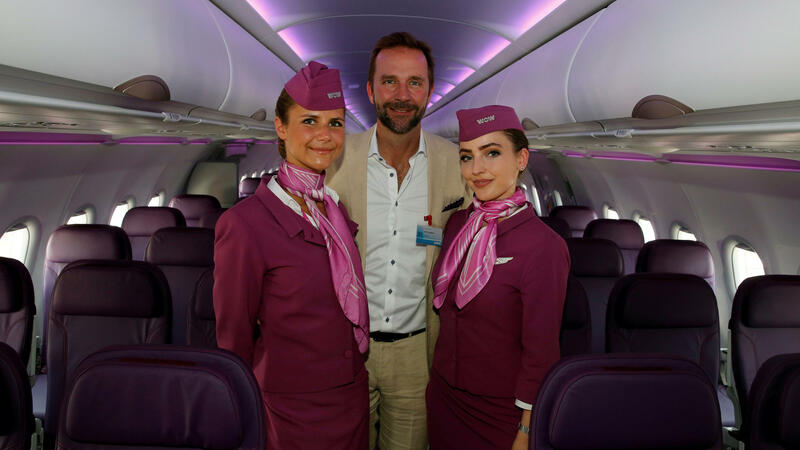 Skuli Mogensen, CEO of Wow Air, poses during a delivery ceremony of his airline's first Airbus A321neo, at the Paris Air Show in 2017. The airline abruptly ceased its operations on Thursday. Wow Air surprised its passengers by abruptly saying it's going out of business Thursday, in a move that left travelers scrambling to book other tickets — and wondering whether they would be able to secure a refund. "WOW AIR has ceased operation. All WOW AIR flights have been cancelled," the low-cost Iceland-based airline announced Thursday morning. For many passengers, the news confirmed their worst-case scenario. Wow had already canceled a number of international flights out of Newark, N.J., Baltimore/Washington International Airport and other airports Wednesday night. In several cases, those cancellations followed hours of delays. "The airline offered hotel accommodations until the next flight," Wow customer Suher Adi said, adding, "but that's not going happen." Adi, who lives in Washington, had been scheduled to fly from Baltimore to Paris, with a stopover in Reykjavik. When her flight didn't take off Wednesday night, airline representatives told her to file a claim for a refund. That word came after hours of delay notices about her flight. "Many passengers are stranded without any place to stay tonight or any idea of what's going on," Adi said in a tweet to the airline last night. And then, Thursday morning, the airline went silent. "It's unclear if there are any options at this point," Adi said. She called the situation "absolutely horrible and shocking." The Icelandic Transport Authority has posted information for Wow customers in the wake of the sudden news that the airline had shut down. But the advice offers little solace, telling passengers to check with other airlines to find a new ticket. "Some airlines may offer flights at a reduced rate, so-called rescue fares, in light of the circumstances," the agency said. Anyone wondering about a refund was told to take that up with their credit card companies. In response to the sudden shutdown, Icelandair is offering discounted tickets to jilted Wow customers, ranging from $60 for flights to Reykjavik and $160 for flights between North America and Europe. "These fares will only be available for passengers who have already embarked on their journey," Icelandair said, "and have a return ticket with Wow air between 28 March and 11 April 2019." Wow customer Alison Fath says she and her fiancé are looking into Icelandair's offer, because the pair no longer have a ticket on a return flight from Paris to Baltimore this Sunday. And in a sign of how travel problems often cascade into each other, she says they can't meet Icelandair's proof-of-travel requirement — because Wow isn't available to issue an e-ticket she could convert into a new ticket. Earlier Thursday, she had posted on the Wow Facebook page, "Currently stuck in Europe." "Anyone have any advice on how to get back to the States," she asked, noting that most tickets are now at least $2,000. For Denise Riordan, the cancellations mean she'll miss what was meant to be her first chance to meet her baby nephew, Ollie, and attend his christening in her native Ireland. Passengers were already boarding her 7:05 p.m. flight to Dublin, Riordan tells Ireland's Independent newspaper, when airline staff announced that there was a problem. After four hours of delays, the flight was canceled. "They said that there will be further information today and asked if we have any questions," Riordan said. "There was uproar — of course we have questions!" Wow Air was founded in late 2011 with the goal of offering cheap flights and competing with Icelandair. People were drawn by the low prices — a flight from Washington to London was recently priced at $139, for instance, with a Boston to Reykjavik trip listed at $99. With its fleet of purple-painted Airbus jets, Wow expanded rapidly, drawing customers from Europe and North America. The airline served 3.5 million passengers in 2018. On its website, the airline says it has around 1,000 employees. In large part, Wow's business strategy hinged on its ability to fly smaller airliners into the U.S. and Europe than their American and European competitors, using one-stop itineraries to offer low-priced tickets between cities that already lacked a nonstop option. "As a consumer you certainly root for it to succeed," Airline Weekly's Seth Kaplan told NPR's Here and Now in 2017, "but the burden of proof is still very much on the airlines who are trying something that hasn't worked until now." Wow was one of several carriers to try new strategies, drawing on two recent trends: high demand for vacation trips and low fuel prices. Others offering low-airfare flights include Danish carrier Primera Air and Norwegian Air.